Electric skateboards are constantly advancing in a way that most other industries can’t keep up with. There’s always some new feature here or there that keeps making these boards super exciting to learn more about and ride around town. They’re getting very popular due to their longer battery life and reliable speed that many boards used to not have when they first came out a few years ago. One of these new age products is the M1 Electric Skateboard. The M1 board is a beautifully crafted, futuristic technological leap in action sports. It’s an amazing creation that has true dedication to perfection in every detail that many other companies seem to avoid to touch on. From the durable wheels down to the core of the M1 board, you’ll get a trustworthy and reliable deck that never fails to amaze. Instead of leaving you with all these amazing bits of information without giving you the full set of details, we’ll go ahead and show you all the key features you need to know about this unique electric skateboard. We’ve done all the research we could through all the blogs, reviews, videos, and websites to find all the little-known details of this electric skateboard. The M1 Electric Skateboard has all of its reviewers going crazy with excitement due to its ease of use, which almost trains you in the most comfortable way possible. What’s even better is the fact that it allows you to choose how you want it to be controlled. Still interested? Read on! One of the coolest features about the M1 electric board is the controlling methods. While every electric skateboard or longboard comes with a wireless remote, not all of them connect to your phone with an app. The M1 board has a pretty impressive app that lets you control everything on your board, including acceleration, deceleration, braking, battery life, and more! It’s pretty crazy to think that an app can control a skateboard, but we just have to keep reminding ourselves that the future is now! The wireless remote that comes with the M1 Electric Skateboard is very impressive as well. It’s incredibly ergonomic, and it wraps around your hand to prevent you from dropping it. Many other brands, in fact most others, don’t include any anti-dropping mechanism. Why wouldn’t they allow you to protect the one thing guiding you while you’re moving over 20 miles per hour? Luckily, the M1 board’s remote does protect you! With the combination of the wireless remote and the smartphone app, you’ll always have a method of controlling your board. These two bits are just some of the many futuristic upgrades that the electric skateboard industry is seeing. However, there are plenty more along the way – like this Blink electric skateboard we have reviewed. The motor on the M1 Electric Skateboard is one of the most impressive batteries on the market. It allows you to go up to 22 miles per hour, or 35 km/h. This range is the perfect middle ground that gives you the comfort of being able to control a quick-moving board without going too fast. At the same time, you’re able to get around from place to place without being too slow to get there. The motor on this electric board is definitely one of its high points. The lithium-ion battery that comes with this board is also a great feature. Lithium-ion is well-known for longevity, since it outlasts all other types of non-commercial batteries in the world. Li-ion also charges much quicker, and has a longer overall lifespan. In fact, the M1 board’s battery charges in only 90 minutes, which is much quicker than any other electric board on the market with the same speed. You’re probably wondering how long the battery lasts though, right? Well, it stays charged up to 7 miles, which is plenty enough to get around town and back without having to worry about a recharge. Even if you do end up having to charge, it only takes an hour and a half to fully charge up! Don’t worry about sudden dying battery life though, since your phone app will tell you when you’re due for a new charge. Another impressive feature for the M1 Electric Skateboard is the durability. They’re very proud and confident in the construction of their products, as they should be. Starting from the core, this board is made with solid poplar wood, which is well-known to withstand all kinds of harsh environments. Poplar wood is some of the hardest wood in the entire world, which obviously means it’s a great choice to keep your board from snapping in half like other woods do! With PU sidewalls and a fiberglass overlay, this deck is the ultimate machine. Many other brands skimp on the construction of the board to either lower costs or raise their profit margin, but the M1 electric board doesn’t cut any corners whatsoever. A cheap board simply ends in bad reviews and unsatisfied customers, none of which the M1 board has. 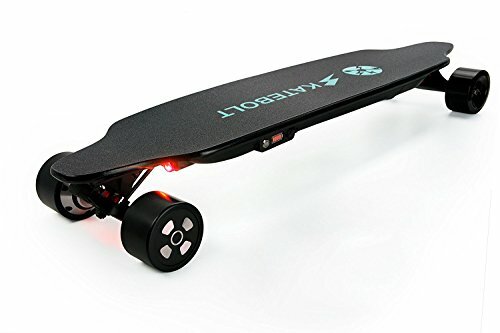 If you’re still worried about a car hitting your board or even you while you’re riding it, this board comes with LED lights on the front and back to prevent that from happening. Although it’s not really a durability feature, it’s an added layer to prevent any harm from coming to you or your board. + The M1 Electric Skateboard uses a pretty impressive motor that gets you up to speeds of 22 miles per hour, or 35 km/h. If you’re trying to get around town or simply have some fun, there’s no better way to move quicker and get some fresh air without breaking a sweat. + The LED lights on this electric board helps show foot traffic and driving cars where you are. Skateboards are very hard to see, especially when you’re driving a car and can’t see that low. However, nobody could miss the bright lights that come from this board. + The poplar core combined with a fiberglass wrap is the ultimate construction build out of almost any electric skateboard or electric longboard that we’ve seen. It’s rare to find a board that isn’t made with at least a little bit of cheap materials, so it’s nice to see such solid craftsmanship. + The double remote system allows you to choose how you want to ride around on your skateboard. If you’re more of a smartphone person who needs no learning curve to get the hang of riding these boards, then this is an awesome feature! – The fact that the lithium-ion battery on the M1 electric board only lasts for 7 miles can be a little bit of a let down for some people. Many other boards go well over 10 miles per charge. However, the battery with this board charges almost twice as fast as those other boards, so it’s a fair trade off. – At 14.5 pounds, this board is a little bit heavier than a lot of the other brands. However, with such a solid construction of poplar wood and fiberglass, you have to expect a little bit of a higher overall weight. The M1 Electric Skateboard is suitable for anyone who enjoys the outdoors and wants to find an alternative method to get around. Sometimes driving a car and sitting the whole time can be a bit boring. For those of you who enjoy being much more interactive with your methods of transportation, electric skateboards are a huge source of fun and a great way to get around. Not only that, but they’re always much cheaper than a new car, that’s for sure! You may also be interested in the Riptide electric skateboard. We like the M1 Electric Skateboard so much because it’s very well-built and designed to protect you and your investment. The fact that it has LED lights, a solid poplar wood core, and hardened fiberglass shows us that this company truly cares about the rider and their safety. It’s very rare to find so many protective features in an electric skateboard or longboard without sacrificing on the battery or the motor, so this is nice for a change. If you’re looking to step your game up to the next level, or you know you really want to get into the electric boarding scene, then the SKATEBOLT Electric Skateboard Longboard is definitely worth investigating. It features a maximum speed of 25 miles and hour, which is incredibly fast compared to most other electric boards on the market. It also has a 20-mile max range per single charge, which is honestly one of the best we’ve ever heard of. The SKATEBOLT Electric Skateboard Longboard is a huge improvement in the electric boarding industry, and it’s definitely one that we’re very happy to see. We’re always impressed by the up and coming newest modern age technology that companies keep throwing into these boards, and this one is a huge leap above most!